Passion Flower of the Christ? The name Passion Flower does not come from aphrodisiac, passion-inflaming effects, but rather from a religious symbolism to the Passion of the Christ. Conquistadors and Missionaries immediately noted a symbolism of the Crucifixion in the Passion flowers. To the missionaries the three stigmas represented nails used to crucify Jesus. The five anthers represented five wounds. The filaments of the flower symbolized the crown of thorns. The vine’s tendrils were interpreted as whips used by his tormentors. The leaves are interpreted in two ways, as the spear stabbed into his side, or the three lobes are interpreted as the Holy Trinity. I have been trying to grow Passiflora Edulis from seed for over a year, a total disappointment so far. I couldn’t have been happier to see a sprawling mass of Maypops on one of the vacant parcels for sale in the development across the street where we walk the dog. This Southeastern native Passiflora Incarnata, also called Purple Passionflower, it is the hardiest species in the genus, surviving as far north as Pennsylvania and Illinois and as far west as Texas. The name Maypop comes from their unexpected popping out of the ground in May after dieing back in the winter. 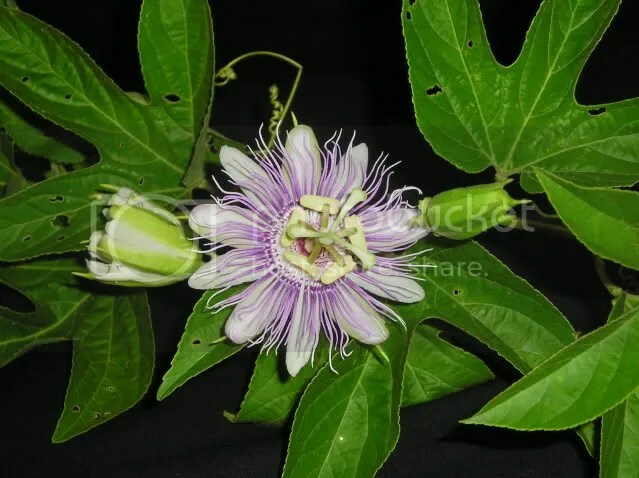 The Passiflora genus is the Tennessee State Wildflower. Cherokee Indians living in Tennessee called the fruit Ocoee, leading to the designation of the Ocoee River Valley. The quality of the fruit, also called a Maypop, or wild apricot, can be variable. Although there are some reports it is tasty. The flowers are not only magnificent, but they are sweetly fragrant and a favorite flower of the Zebra Longwing. I thought I saw a zebra swallowtail also, but I may have been mistaken. I’m trying to root a cutting because it seems like my P. edulis will never flower!